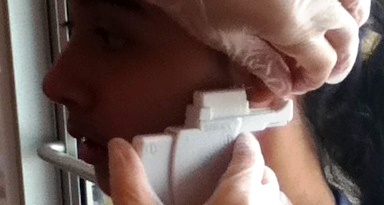 That's the little one having her ears pierced earlier today. FINALLY! She's been talking about it for months but was kinda' nervous about it. She's not scared of the act of piercing itself. She's worried about not being able to keep the piercings clean enough during the healing process. She finds the task of cleaning them 3x a day and rotating them regularly daunting so she's been putting it off for months now. Today, she finally said she wanted to do it. We were out to buy ink & stamps and some artificial plants for the house. We had no idea where to go to get it done so we asked a lady in the jewelry section of the department store and she suggested Claire's ~ it's an accessory store mostly but they do ear piercing in the store as well. Fortunately it was just a few doors away from the department store itself. We walked over and that was it. There were a couple of girls ahead of her so she saw the process which made the experience a lot easier because the 2 girls didn't even flinch when their ears were pierced. They also assured the little one that it didn't hurt at all. It was a great experience for her. This is her first major decision for herself. We intentionally didn't have her ears pierced when she was a baby because we wanted her to decide if she wants them pierced or not. It took her a while to finally make up her mind but she said she's glad she went for it today. Cool!